There’s just something about shark movies that people can’t seem to resist. The experience of seeing ruthless, cold-blooded killing machines on the big screen awakens the visceral fear we have of the unfathomable abyss that is the ocean and the monsters that reside in it. The Meg is the latest Hollywood entry into the killer shark genre. Since Steven Spielberg’s classic film Jaws was first released, succeeding movies in the genre have done nothing but create a scarier, more formidable shark. While the Megaladon may be scary big, though, there were other shark incarnations that hypothetically pose a much bigger threat than the Meg. Here’s a list of movie sharks that we wish Jason Statham could have fought against. There’s nothing scarier than sharks that can ski. While this isn’t a problem for people who live in the tropics, imagine going on vacation to some ski resort way above sea level only to find out that sharks have somehow managed to swim… in ice? The thought of avalanche sharks will make anyone think twice about making snow angels. You’ll never know if a chomping, bloodthirsty devil may be lurking underneath. Sharks are scary. Ghosts are scary. But what happens when you have a shark that also happens to be a man-eating ghoul? Be warned, your irrational fear of swimming pools and bathtubs may be triggered by the sight of this demonic fish. The Ghost Shark is a creature only someone like Jason Statham ought to face. If great whites aren’t scary enough, how about a Kraken-shark crossbreed? Created to be the US Navy’s super-weapon, the Sharktopus is a worthy contender to the Meg. A man-eating beast with tentacles will keep you off the waters for good. Beware, sunbathers. If Statham isn’t there to save the day, your next tan at the beach may very well be your last. They say that two heads are better than one, but not when both heads are vicious beasts hardwired to eat you alive. Perhaps even Jason Statham might find it difficult to fend off such a ferocious freak of nature. Ok, so Bruce isn’t exactly bad. After all, Bruce pledged, “fish are friends, not food”. However, as Marlin and Dory found out the hard way, the faintest smell of blood is enough to turn the most benevolent shark into the mindless killer that it naturally is. It would be cool if a cartoon Jason Statham could have been there to stop Bruce from almost eating our favorite Disney fishes. Perhaps, Disney can consider a rated-R director’s cut of Finding Nemo? 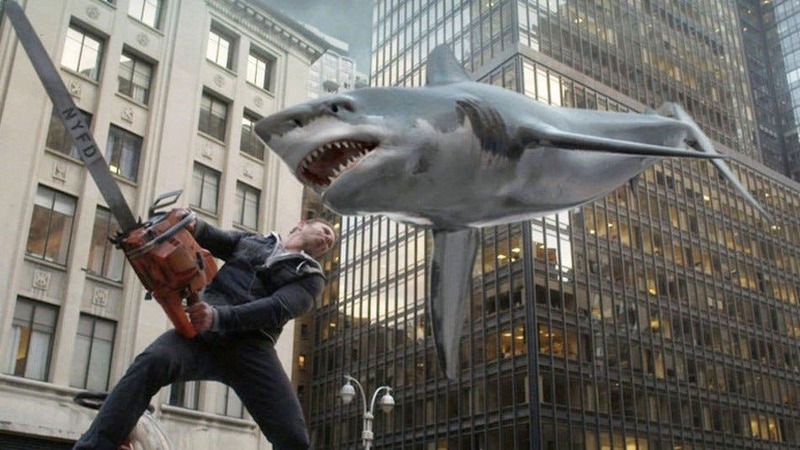 A Syfy classic, Sharknado is the ultimate film we wish Jason Statham could have starred in. That incredibly epic chainsaw scene would have been even more epic if only Statham could have been the one who jumped head on to the great white, slashing its guts from the inside, in a sheer act of gruesome, gratuitous violence. Is there any other movie shark you wish Jason Statham could have fought against?